There a few foods for me that- if they were actual living and breathing men- I would almost definitely be having a torrid love affair with. That’s how much I love them. First, there’s pancakes. Pancakes are the bad boy- the guy I KNOW is so bad for me. So, so SO very bad. (Like all the sugar and carbs in the pancakes that are so terrible for my thighs and derriere.) But he’s also the one that can make my entire day just by making an appearance. He’s the one I can’t turn down or resist. He’s so bad, that he starts to actually feel good. For me, if pancakes were a man, he’d be like Johnny Depp, Dwayne “The Rock” Johnson, and Tom Hardy all rolled into one. Seriously, how am I supposed to resist that? Then there’s the iced sugar cookie. This is the ‘older guy’;very handsome and sweet, classic, traditional and dependable. Like a fine wine, no matter how old he is, I never get tired of him- he gets better with age. He’s great in just about every way, but still probably not the one I should be with just because he’s so much older than me ( just like I probably shouldn’t indulge in sugar cookies all the time). But I’m still drawn to him because, hey he’s awesome. The iced sugar cookie for me in “guy-form” would be somewhere in between George Clooney, Idris Elba and Jimmy Smitts- thus, explaining my ongoing obsession with it. 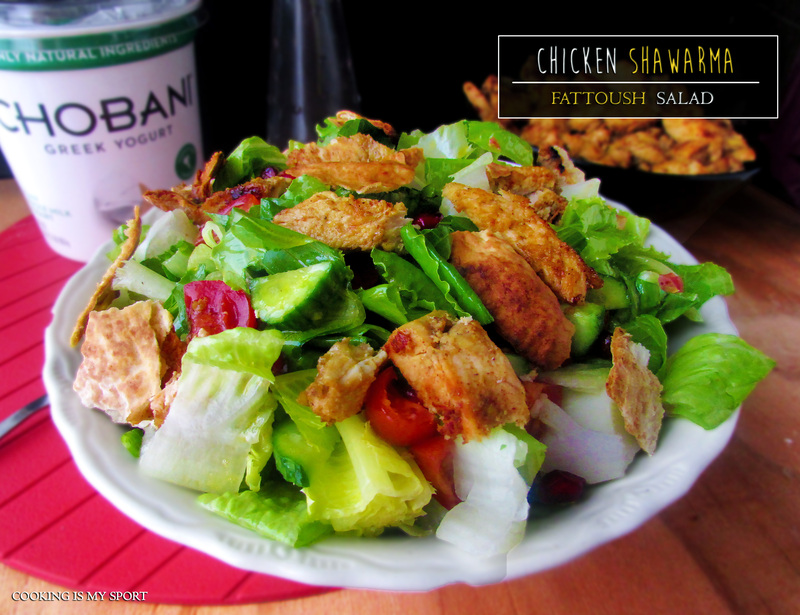 Then, there’s chicken shawarma and fattoush salad. Good news: this is the ‘good guy’. The ‘nice’ guy. The one I don’t have to feel guilty for being hooked on, because he’s actually great for me in a lot of different ways. Stable, wholesome, considerate and just full of good stuff. I can give it all I have with him and take all I can get because I know it won’t hurt later. Chicken shawarma and fattoush are kinda like that too-I’m hooked on them, but I don’t ever have to feel guilty for craving/eating them because hey, there’s never any harm in eating white meat and veggies, right? 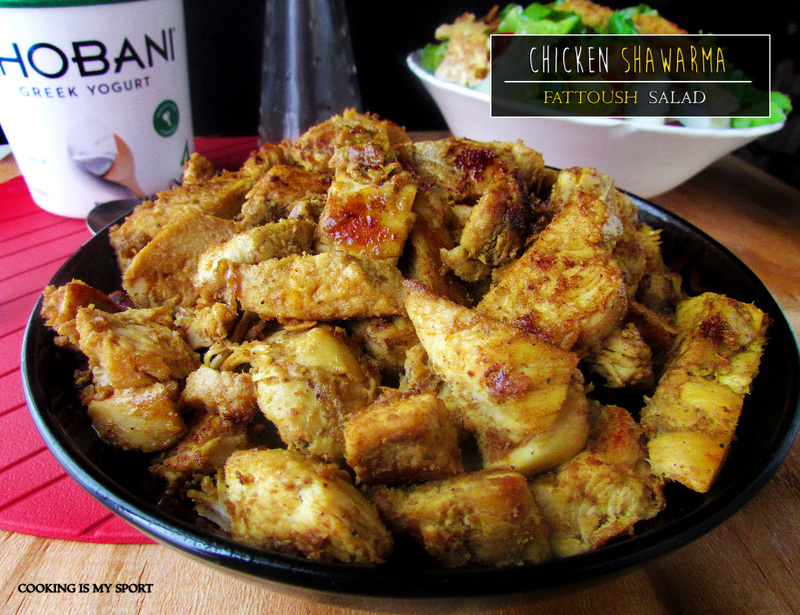 Yeah, chicken shawarma and fattoush salad is like Ryan Gosling or Chris Hemsworth. (Sigh). And now that I’ve beaten that metaphor to death, I may as well get on with the actual point of this post. Chobani yogurt is just awesome,isn’t it? Not just because of the taste, but also because of the versatility of the yogurt as an ingredient- you CAN do more with it than just open the lid and dip into it with a spoon. Right now Chobani is holding a #MadeWithChobani Project that shows all the different ways that yogurt can be used in every day cooking. 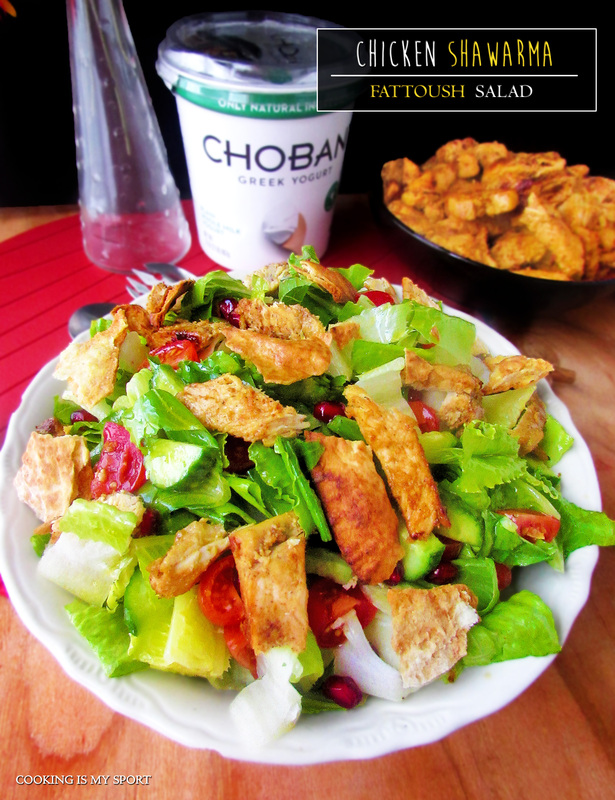 It unites food bloggers in a collective effort to use Chobani yogurt to create a healthy, but still delicious recipe. I definitely wanted to be apart of this project; I thought about doing something sweet- let’s face it, it’s easier to make a sweet dish with yogurt, especially since Chobani has so many delicious sweet flavors. However, I eventually decided against it, opting instead for a more savory application. This is what I finally came up with, and I have to say, I’m really happy with how it turned out. The best chicken shawarma and fattoush salad I’ve ever had comes from an awesome Middle Eastern restaurant in Ann Arbor. It’s just so, so, SO good. Because I don’t live near Ann Arbor, I don’t get to eat there very often, but I have to say that this recipe gives me a pretty good -tide-me-over. What makes this distinctive from the restaurant is that instead of keeping the dishes separate from each other, I combined them together in one healthy, delicious salad. This dish just wouldn’t be what it turned out to be without the Greek yogurt (and I’m not just saying that). It makes the chicken SO moist and tender. So don’t skimp and buy some cheap, non-name brand yogurt. It’s not gonna come out the same. 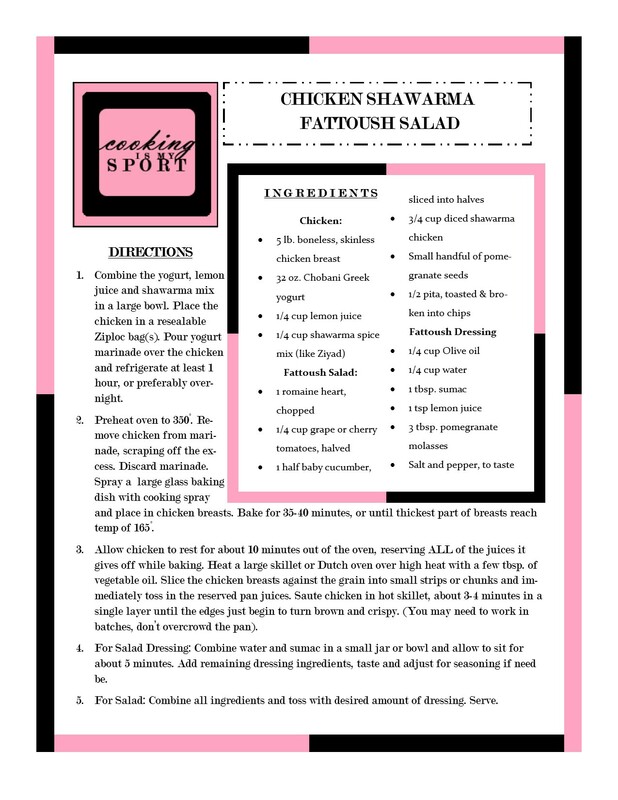 You need a good, creamy, high-quality yogurt for the shawarma marinade. 1. Combine the yogurt, lemon juice and shawarma mix in a large bowl. Place the chicken in a resealable Ziploc bag(s). 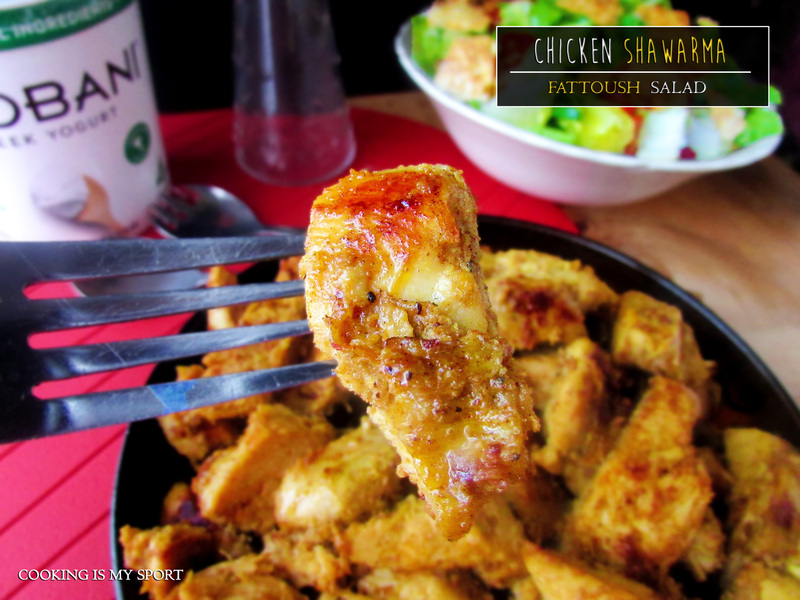 Pour yogurt marinade over the chicken and refrigerate at least 1 hour, or preferably overnight. 2. Preheat oven to 350°. Remove chicken from marinade, scraping off the excess. Discard marinade. Spray a large glass baking dish with cooking spray and place in chicken breasts. Bake for 35-40 minutes, or until thickest part of breasts reach temp of 165°. 3. Allow chicken to rest for about 10 minutes out of the oven, reserving ALL of the juices it gives off while baking. Heat a large skillet or Dutch oven over high heat with a few tbsp. of vegetable oil. Slice the chicken breasts against the grain into small strips or chunks and immediately toss in the reserved pan juices. Saute chicken in hot skillet, about 3-4 minutes in a single layer until the edges just begin to turn brown and crispy. (You may need to work in batches, don’t overcrowd the pan). 4. For Salad Dressing: Combine water and sumac in a small jar or bowl and allow to sit for about 5 minutes. Add remaining dressing ingredients, taste and adjust for seasoning if need be. 5. For Salad: Combine all ingredients and toss with desired amount of dressing. Serve. 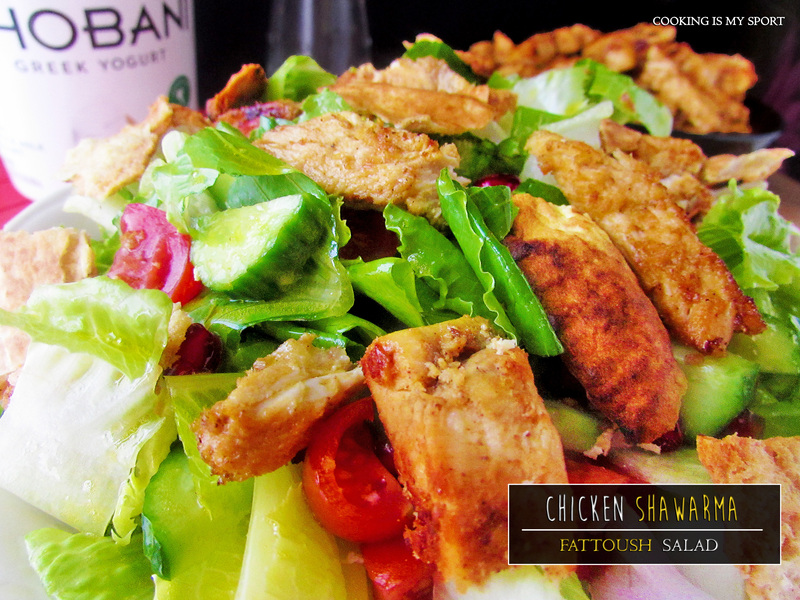 Love the salad and I love Chobani yogurt. Really great recipe. my favorite Middle Eastern foods, period. I have to say that it is, thank you Sarah! Wonderful recipe! And it looks absolutely scrumptious! This sounds really good for you AND really good!! Which is awesome! Because those two things don’t always coincide! I just may have to try this! I’ve never had shawarma or really any Mediterranean food!